Success in the Classroom, in your Career and on the Field. Student Athlete 101: College Life Made Easy On & Off the Field, helps all student-athletes get the most out of their college experience from day one on campus. This how-to-guide gets straight to the point with tips and strategies to take advantage of being a student athlete, regardless of your sport, in the classroom, on the field and after graduation. Whether you're a scholarship athlete or walk-on, this book is an invaluable resource for all high school and university student-athletes. It provides a winning game plan for student-athlete success. This is the go to book for NCAA athletic programs, college and high school coaches, athletic departments, sports camps and parents. “ANTONIO TAUGHT OUR STUDENT-ATHLETES LESSONS THAT APPLY TO THEIR ATHLETIC CAREERS AND BEYOND. HIS PASSION AND POSITIVE ENERGY WAS CONTAGIOUS. OUR STUDENTS LEFT HIS PRESENTATION EXCITED TO FACE THEIR CHALLENGES AND LEARNED STRATEGIES TO IMPROVE THEIR PERFORMANCE. IT WAS GREAT TO HAVE ANTONIO HERE! WE LOOK FORWARD TO HAVING HIM BACK ON CAMPUS IN THE NEAR FUTURE!" Antonio Neves is a nationally recognized college leadership speaker, student-athlete and millennial expert and award-winning journalist. 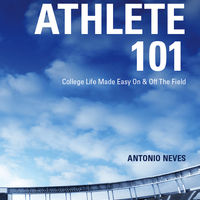 A former NCAA Division I student-athlete, Neves Antonio is a graduate of Western Michigan University and he holds a masters degree from Columbia University. A nationally recognized college leadership speaker, Antonio regularly keynotes at colleges, conferences and corporate events about how college students and millennials can create their own luck in their life. His message focuses on leadership, communication and career success. He has delivered keynotes at top colleges and events including Stanford University, the Consumer Electronics Show (CES), Syracuse University, Big Omaha, Louisiana State University, University of Southern California, AFLV, University of Arizona, University of Montana Western and more. An award-winning journalist, Antonio served as a business correspondent, host and producer with top networks including NBC, PBS (Macneil/Leher), Advertising Age and BET Networks. Antonio’s business articles and videos regularly appear in Inc.com, Entrepreneur.com, Money and Forbes. Antonio began his television career co-hosting Nickelodeon’s hit show, U-Pick Live. I’m from a small town in Michigan. One of those small towns that people don’t leave. I graduated from high school with a 2.6 GPA. I was the first in my family to attend college. Sports always came naturally to me, but academics were another story. I entered my freshman year at Western Michigan University as an average student and a walk-on on the track and field team. To my surprise, that first year in college things went extremely well. So well that I earned a 3.6 GPA. I also went on to develop incredible relationships and obtain internships with top companies like Kraft Foods and Walt Disney World. That success left me determined to figure out how I did it and how other student-athletes can experience success as well. The good news – I figured out the formula for student-athlete success and in my book I share everything I learned. In Student Athlete 101, you’ll find all the tools you need to get the most out of your college experience from day one on campus. While I didn’t become a professional athlete, I did go on to earn an athletic scholarship and become an All Conference athlete. More importantly, my success in the classroom, with internships and building relationships, led to the successful career I enjoy today. I even earned a Masters degree from an Ivy League school. Enter your e-mail address for free updates. Antonio Neves is a nationally recognized keynote speaker at colleges, conferences, and corporate events. His message focuses on on leadership, personal branding, career success, and how student-athletes can get the most out of their experience on and off the field. An in-demand speaker, Antonio has keynoted at top colleges and events nationwide including Stanford University, the Consumer Electronics Show (CES), University of Southern California, Big Omaha, AFLV, University of Arizona, Syracuse University, Dream Careers, NGLA, Drexel University, OTA, Rensselaer Polytechnic Institute, the ADCOLOR Awards, Louisiana State University and more. Whether speaking at a college or conference, hosting a major event or moderating a panel, Antonio's leaves attendees motivated, empowered and equipped with the tools to take positive action. To book Antonio to speak, host or moderate your event, complete this speaker request form or e-mail booking@theantonioneves.com.